This lemon blueberry crumb cake needs to happen in your kitchen now. And it has no butter!. 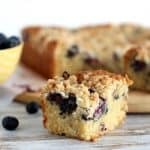 A splash of sunshine in the middle of winter for those of you up north, or the perfect summer cake for us in the south, it is as good as it looks, full of crunch, juicy blueberries, tangy lemon and a tender crumb that is ridiculously easy to make. There are some flavors that work year round and on every occasion. Lemon is one of them. The cake itself is made from a crumb mixture that’s divided, some for the topping and the rest mixed with a few other ingredients to make a proper cake. Well, it’s truly amazing and there is no creaming of butter involved. For some reason, I find it very appealing. What’s interesting is that it’s a coffee cake made with oil. So it comes together really fast. 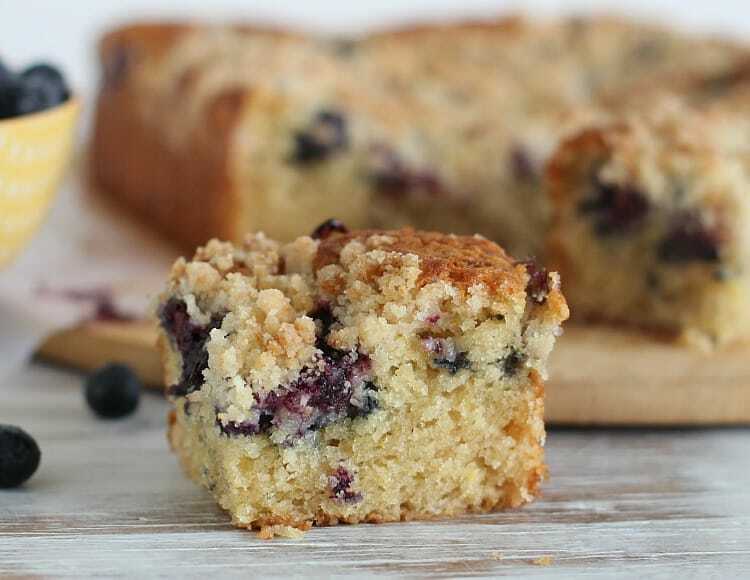 Recipes like this lemon blueberry crumb cake keep me going and happy in the kitchen. And a food blog with easy, scrumptious recipes for coffee cakes is always welcome I think. This one certainly fits the bill. Lemon and blueberries are best friends, we all know that. If you want to try other flavors I would suggest some acid on either the fruit or the zest. Like strawberries and lime. I made it with oranges, no fruit, and olive oil. It turned out sooo good!. It was such a crowd pleaser, my dad being at the top of the crowd. He even took a doggie bag home for the next day’s breakfast. As with most citrus and/or berry cakes, you can use lime or oranges, and strawberries, raspberries or blackberries. They all work wonderfully. They can be made into muffins too. This would be a great cake for mother’s day or a spring lunch. You can use other citrus and/or berries. Preheat oven to 325ºF /170ºC. Lightly butter or spray a non-stick 8 inch round or square pan. In a bowl stir flour, sugars, zest and cinnamon. 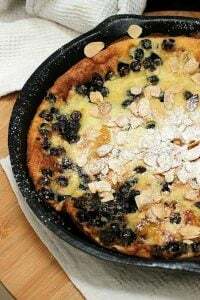 Make a hole in the middle, add oil and lemon juice and mix with a fork until flour is evenly moistened and mixture forms clumps. Set aside 1 cup of this mixture. To the remaining mixture add egg, sour cream, vanilla, baking powder and baking soda.Mix well with an electric mixer until batter is smooth. Spread in prepared pan, scatter blueberries on top and sprinkle with reserved cup of crumb mixture. Bake for about 40 to 45 minutes, or until dry, golden and a tester inserted comes out clean. Wonderful recipe, nice explained. Thanks! 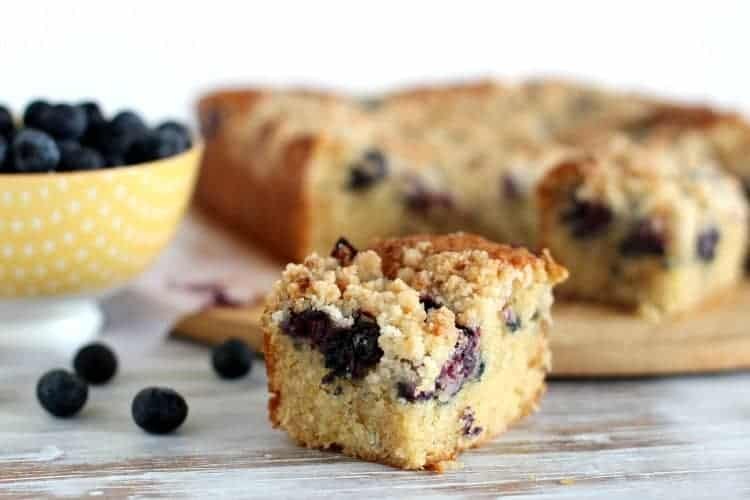 What a delicious looking blueberry crumb cake! that looks wonderfully homely! greta with a cup of tea. or a blob of cream. ooh, my comment didn't seem to appear. i love how homely this looks. cup of tea and perhaps a blob of thick cream; perfection. Just gorgeous, Paula! I'll have to try this! Looks fantastic, and seems to be simle to put together, so it is a must-try! This is one of the best flavour combinations of all time! I love baking with sour cream – it makes cakes so delightfully moist. Your cake looks beautiful and delicious, especially with that crumb topping! The cake looks really moist and beautiful. It would be great with some coffee or tea. Paula, your Lemon Crumb cake would be a perfect breakfast teat for me as well – have to agree with your dad there. I always enjoy a slice of "Coffee Cake" in the mornig. What a nice treat! Hope things will run more smoothly very soon (work and all)! Paula, This crumb cake looks so wonderful…would love to have a piece with my morning cup of tea! It would make my morning perfect! Paula, This crumb cake looks so wonderful… What a nice treat! Hope things will run more smoothly very soon (work and all. I’d eat this beauty for breakfast and then again for dessert! This flavor combo cannot be beat! I would too Liz! Have a great day my friend!